by going to Mediafire on download (129,02 MB). However, Pietro is creating a new site since topmasterforum has created problems for you. We hope the new site is of your own liking. I hope you subscribe to many and help us in the various MODs. This Grand Prix game site is always number one. In the new we include various MODs. Soon I will post the link to the new site. It is mostly for us Italians, but you are all well accepted and you can speak in your own language. An affectionate embrace to all of you enthusiasts to Grand Prix! For Grand Prix 4 you have to ask Pietro. Edited 1 time(s). Last edit at 07/15/2017 02:11PM by Orloff. If you want, you can use the carshape I created. You can find it in Grand Prix 3 2017, in the folder: gpxpdata. If next year you want to help me for Gp3 2018, the MOD will be ready before. I like to map car, but it takes a long time. so they are more realistic. > If you want, you can use the carshape I created. > MOD will be ready before. > I like to map car, but it takes a long time. > so they are more realistic. Sure you do the best way you have to. and what would happen at all. We will see in February how the cars will be. Hi , sorry. i can find 2 carskins for each team, with the correct number for driver, in your file. But , is there a mode to export both for each team (in my GP3Editor it seems 1 skin per team), or i need to choice one of them , from your skins? 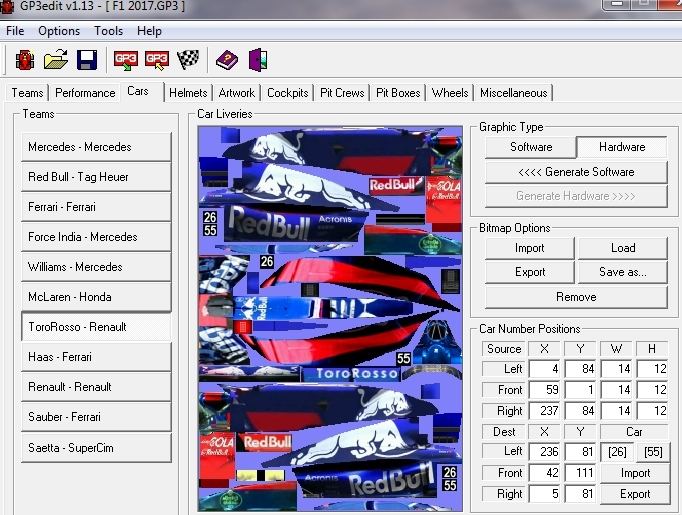 There is a way to put the number in GP3Editor to place different numbers in right positions but I never tried to do this way. I use GPxPatch to insert the jam files to the right place, 'cause I change skins in original GP3 but run the UNIVERSE Mode. to see the nose changes the coordinates. Yes, this is what I meant but you didn't get the numbers as they look that way (( and what about drivers' names shortenings? I'm fine with the numbers, just learn which driver to match. However, Pippozzo can do as much as he likes them.